Flush bolts are used most often on french doors. Generally when you have a set of double doors, one of the doors is inactive the majority of the time and the other door closes into it. In other words, the hinges are on the outside and the doors close together in the middle. The inactive door is held closed with a flush bolt at the top and bottom. 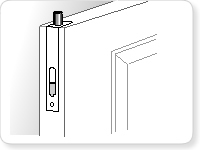 Flush bolts are recessed into the door edge (top and bottom) and slide upward or downward into the jamb (or threshold) to keep the door closed. Flush bolts are available in square and rounded corners and in various sizes and finishes to match up with your existing or new door hardware. 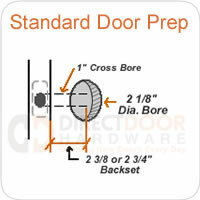 Before ordering, you'll want to check your existing door and see how it is prepped to be sure and order the correct size. Check the overall height and whether it has rounded or square corners. If your door is not prepped for a flush bolt and you just don't want to mess with it, a surface bolt will accomplish the same thing and mounts right to the surface of the door.